Social Media is a term that refers to websites and apps on which people can interact with each other by uploading photos, typing updates, or sharing articles, memes, and other information. These sites include Instagram, Facebook, Twitter, Pinterest, Linked In, and Ello, just to skim the surface. Linked In, I understand, has a vast quilting community, however I have not gotten myself lost in it yet, and the same is true for Ello, which is a site exclusively for makers. Pinterest is fantastic for gathering ideas from all over the internet. 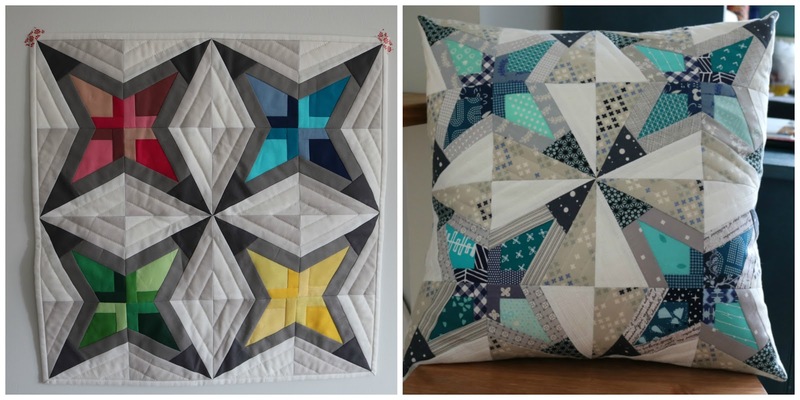 You can search "blue modern quilt," for example, if you want to make a blue modern quilt, and then save the ideas that pop up for future inspiration, or even full-on patterns and tutorials. You can save these ideas on their own "boards" so they are easily retrievable. Pinterest is mostly for visual inspiration or short bursts of information, like recipes.Twitter is largely verbal. It's a great way to guide people over to your blog or your instagram page, but you can also share photos there. I like it as a place to follow politics or comedians, as well as writers who are adept at getting their full point across in 120 characters (or whatever it is). Facebook can be a great place for quilters. There are large "groups" to join in which you can ask specific questions related to your craft and REACH THE RIGHT AUDIENCE for your question. More about that in a minute. On facebook it's very easy to share information that you want other people to see. You can write, with words only, or you can share a picture with no caption, or you can combine them. Instagram requires a photo which you can then add a caption to. Because it is all photos, it's a great place for artists, who are visual people. They're aren't a bunch of words in the way of our pretty pictures! We can look at fabric and quilts all day. ~How Can I Control What I See On Social Media? Like what you like. Heart what you heart. Comment when you have a comment. Downvote what you want to downvote. You can tell Facebook "I don't want to see this." Follow the people you want to follow. If you're creating a new account this is very easy. If you have an existing account that you want to shape into a quilting haven, that might require unfriending people who might get their feelings hurt. For this reason, I keep facebook as a personal family and friend sharing place, and instagram as a public forum for my art. I was able to create my instagram account from scratch and mold it into what I needed it to be. ~How Can I Get More Likes and Followers? Find the right audience. When I post a picture to my personal page of my mail art, I might get ten likes. When I post to a Jamberry Nails group with 20,000 nail fanatics in it, I might get several hundred likes. The same goes for quilting! Maybe not all your personal friends understand what goes into a quilt, but everyone in "Quiltville's Open Studio" certainly will! Obviously, your worth is not determined by likes and followers, and you certainly can't rely on the opinions of strangers to feel validated in your art, but if you're trying to reach the right people and receive more exposure on the internet, it's important to find the right audience. Use hashtags! Hashtags are a method of categorization. They immediately fill your post into the appropriate category. If I post a picture of the Fancy Forest Quilt I made out of Moda fabrics, I'm going to hashtag it #fancyforestquilt #elizabethhartman #showmethemoda . This way, every time ANYONE searches those hashtags, they will see my quilt! This might provoke them to go to my page and see what else they like, and frequently this is how you get new followers. Tag the appropriate people! In the same post I might also tag @ElizabethHagh, the pattern designer, so she can see what someone has made with her design. If I'm using Alison Glass or Kate Spain Fabrics, I'll tag them as well. This has occasionally resulted in that designer sharing your photo on their own personal account! Suddenly your exposure has increased exponentially. By tagging the Fat Quarter Shop in my Snapshots Quilt picture last year, I had my photo shared by the Fat Quarter Shop and Moda Fabrics. Thousands more people saw my quilt than would have if I had not used the appropriate tags and hashtags. Participate in swaps! Swaps are one of the most fun parts of instagram. When you see a swap open, fill out the form and you're in ! You make something for a stranger, a different stranger makes something for you, and almost everyone else in that swap will follow you! They'll do this because you clearly have similar interests, AND they want to see what everyone is making and guess which one could belong to them! They're a really fun way to meet new people and make beautiful things. ~How Do I Find People To Follow? 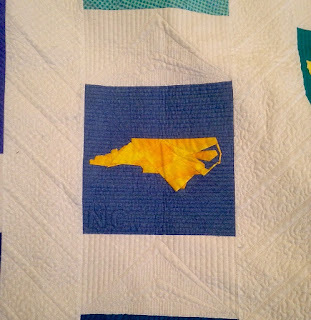 Click on someone's profile who is a quilter (hint: I'm one). On the top part of the screen you'll see how many people they follow. You can click on "following" and you'll get a list of all the people they follow! If it sounds like they're a quilter, sewist, or fabric designer, follow that person! You can always unfollow them later if you're unhappy with the content. ~How can social media actually help me as a quilter, though? Because of instagram, I was introduced to Alison Glass and Elizabeth Hartman and found fabrics and patterns I really, really, loved. Because of Facebook I learned of Bonnie Hunter's mystery quilts and Leah Day's Free-Motion-Quilting designs. Simply by existing in the community you will see and be exposed to new patterns, new fabrics, new techniques, and new people! It's really fun to see what the designers and big manufacturing companies have coming out soon and what they're excited about! 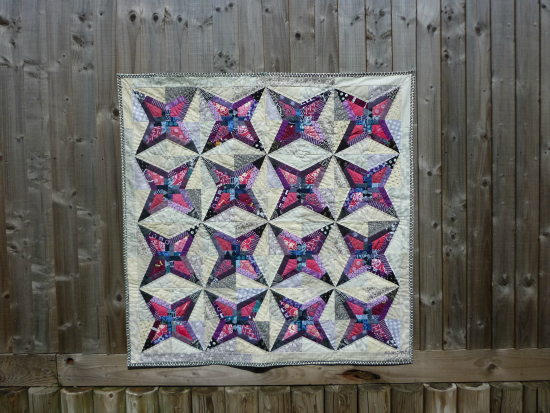 Week 4: Jackie Marks: When do you sew? Hi! I'm Jackie Marks and I'm thrilled to be hosting the takeover this week. 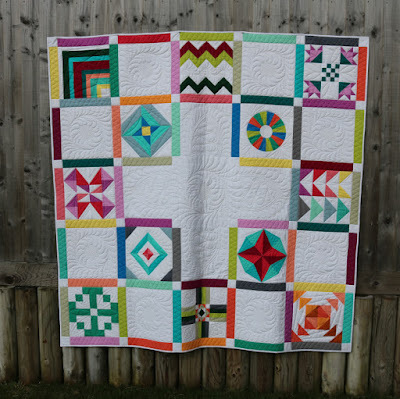 I've loved following 52 Quilters for almost its entire run and it's such a great way to become exposed to new quilters! I'm a Florida Girl, major Harry Potter and Star Trek nerd, and a military wife. Moving to new places a lot gives me a rare look into various quilting communities and styles of art. It's been the best way for me to "plug myself in" to a new community since my kids started school. 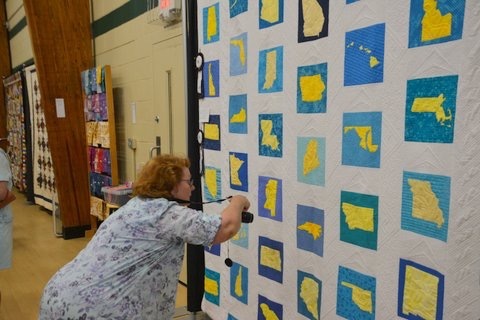 The midwest is serious about their quilts so Northern Minnesota is a great place for me to be right now! One of the questions I get asked most, in person, is "when do you do all this? When do you sew?" I don't always know how to answer this with a better response than "ummmmmm literally always." So here's a rough breakdown. My girls are 5, 7, and 9, so they do still need some attention and care but they can also entertain themselves for long periods of time and help me out with chores. After school dropoff on Mondays, Wednesdays, and Fridays, I'm home from 8:30 to 2:30 by myself. That's six hours! I get some dishes and laundry done, but then, you know what? I'm gonna sew. My house will not be spotless. If your house is spotless, that's cool, but mine is, um, not. One day a week my husband and I go out for a day date during his lunch hour but even on those days I get at least an hour or two to sew. Tuesdays and Thursdays I work a part-time job and my girls have extra-curricular activities in the afternoon, so there's only a little sewing on those evenings - usually a pattern cut out or some chain-piecing done. And then weekends, I gotta say, are mostly sewing (and definitely some putting away laundry). My husband will sometimes take the girls to a movie, the gym, or ice skating; and sometimes we'll go do a family thing, but normally we're pretty low-key and we hang out at home. It's just important to me, and my family understands that I need the time and the creative outlet. I'm also pretty fast (read: impatient) so I think people may be over estimating the time it takes me to do these projects and they think, gosh, where do you get all this TIME? I just do it! I start, and I can't stop until it's done, which I'm certainly not advocating as a healthy way to balance life and hobby, but it's what works for me. What works for me, though, may not work for you and that's okay. It's important to figure out what works for you and embrace it. Some people work best in the mornings and some people work best in the evenings. Some people need a clean house, and some people are able to let that part go. It's all okay! When do you sew? What works for you? Hello All, I'm Reene Witchard and I'm really excited to be taking over this week. 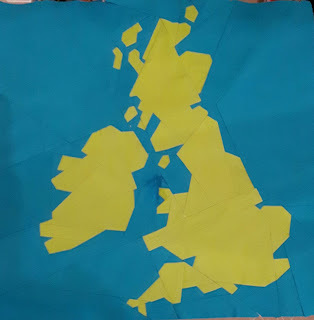 I live in the East Midlands, UK with my hubby and teenage daughter. I've been blogging as Nellie's Niceties for about 7 years, along with my Mum, Yvonne, but these days I spend a lot more time on Instagram as Reeneatnelliesniceties. Patchwork has been a huge part of my life for about 8 years. It started purely as a therapeutic hobby when I was struggling with my chronic neurological illness and caring for my daughter who was bed-bound with Chronic Fatigue Syndrome. Over time this wonderful hobby has developed into so much more. I've been designing the block of the month programme for Quilt Now magazine for the past 3 years which is a blast. This is the first block of the month quilt that I designed; a 12 month technique sampler that is now called "From Nellie, with love" and currently running as a BOM through our website. The second BOM I designed was a more traditional single block a month sampler using Kona solids. Completely different from the first one but I love it just the same. This year I've designed the BOM to include two monthly blocks; one machine pieced and one English Paper Pieced. 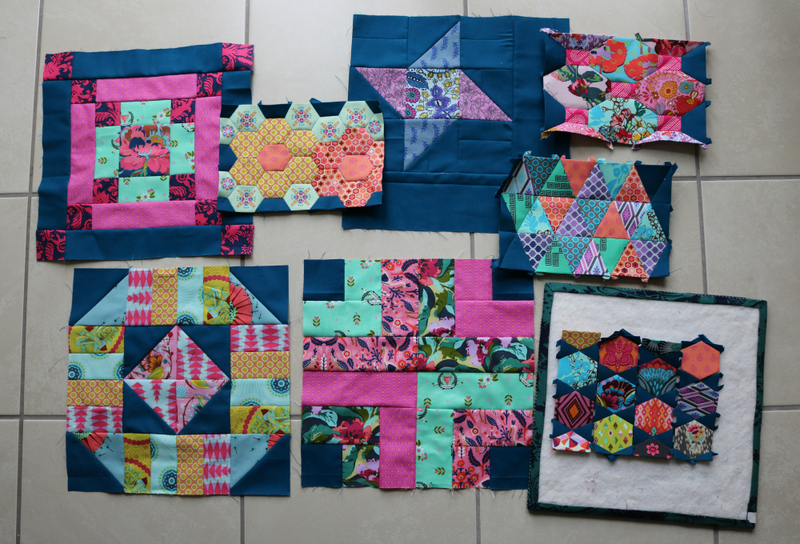 Here are some of the blocks that I have made for the print version that I am sewing along with. I am really excited to have sneaked some EPP in there as it is my latest obsession. Whilst recovering from surgery a few years ago I needed a sewing fix but couldn't use the machine so a hand project was essential. Once I discovered that I could draft my own patterns using shapes other than hexagons I was off and running in no time. The house is now full to bursting with EPP cushions. 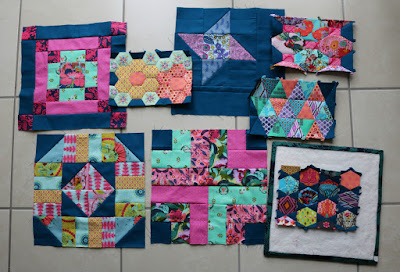 I love saturated colour, vibrant prints and quilt designs that produce secondary patterns. One of my most favourite designs is Kaleidoscopic which was originally featured on the cover of Quilt Now magazine. I have since gone on to make a couple more versions of this pattern and I love them all equally. I'm really fortunate to have a dedicated sewing room where the majority of my creativity takes place but I'm a messy crafter so projects often spill out into other rooms around the home. I'm currently working on a new EPP design that I've called Hidden Hearts, you can see my progress on Instagram using the hashtag #hiddenheartsepp. So far there are pieces of this in my front room and bedroom along with my sewing room so it's well travelled. If you're a fan of EPP you can find lots of free PDF templates for various designs on our website, Below are a few examples and if you're really keen on EPP you can find more patterns in our Payhip store. 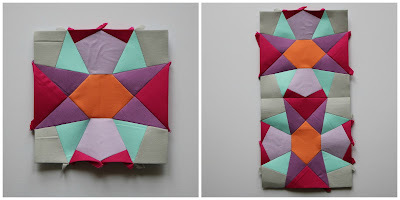 I'll leave you with another of my favourite makes, this time a quilt and cushion set that I designed for Love Patchwork and Quilting magazine: Candy Chains. All that Cotton and Steel fabric makes my heart sing. A few days ago, I wrote a post about how we are trying to leave our cable company. You can read about the research and the first steps here. Ich habe vor ein paar Tage eine Post geschrieben der beschreibt wie und warum wir versuchen unseres Kabel loszuwerden und uns auf "streaming" umzustellen. Man kann über unsere ersten Schritte hier lesen. My last post ended with us having installed the antenna so we can receive our local channels. Of course the day after we did that, the most popular of our local channels announced that they are now also on Amazon Fire! Dieser Post endet wenn wir unsere Antenne installiert haben um unsere Lokalnachrichten weiterhin sehen zu können. Am nächsten Tag hat dann die populärste Lokalstation angekündigt dass sie jetzt auch durch Amazon Fire erhältlich ist! On Tuesday, we received the Fire stick I had ordered. I plugged it in and sat down to go through the set-up process - surprise! The thing comes already set up as long as you order from your own account! It took less than 30 sec. to figure out how to operate it....In addition, it has a smart phone remote app! Am Dienstag ist dann unser Fire Stick angekommen. Ich habe ihn eingesteckt und mich aufs Sofa gesetzt um das Ding zu programmieren. Und wie war ich dann überrascht, als ich entdeckte dass der Fire Stick schon per-programmiert ankommt (wenn man ihn von seinem eigenen Konto bestellt). Es hat ganze 30 Sekunden gedauert zu lernen wie man den Stick bedient, und er hat eine App! I had read all the glowing reviews and as always did not quite believe them. I have to admit I was wrong. The variety, convenience and ease of operation is way above our expectations. BHE (Best Husband Ever) and I have decided that, on Sunday, we will turn off our cable box for a week. At the same time, we will start our one week free trials for HULU and Sling. That way, next Sunday, we will know what we need to do (turn the cable box back on, or turn it back in to the cable company). Ich hatte all die tolle Kundenrezensionen gelesen, und habe das alles nicht ganz geglaubt - die waren ein bisschen zu gut. Aber, ich muss zugeben dass ich das jetzt bereue. Die Vielfalt, Bequemlichkeit und Bedienungsfreundlichkeit liegt weit über unseren Erwartungen. BHE (Der Beste Mann der Welt) und ich haben beschlossen am Sonntag unsere "cable box" für eine Woche lang abzuschalten. Wir werden am selben Tag unsere kostenloses Probe-Abo für Hulu und Sling starten. Am nächsten Sonntag wissen wir dann was wir tun wollen (die Kabel Box wieder einschalten oder sie an die Kabel Firma zurück bringen). Today, I ordered the last pieces of equipment: an Amazon Fire TV (not the stick but the bigger one) and another stick. I am not sure I completely understand what the difference is between the TV Fire and the stick, but I did see that it has a larger storage capacity. Ordering this piece added $35.00 to our start up cost (bringing the equipment cost to $219.00, the exact amount we pay for one month's cable service). We will install it in our living room, and the other stick in our bedroom. 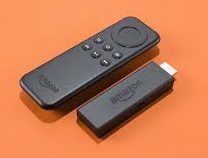 This is a purely optional choice we are making - the Fire stick is extremely portable; you just pull it out of one TV and plug it in to another. We have chosen to have a couple of them and just leave them plugged into the TV's we watch the most. Heute habe ich die letzten paar Apparate bestellt: einen Amazon Fire TV (nicht den Stick aber den grösseren Apparat) und einen zusätzlichen Stick. Ich bin mir nicht sicher was der Fire TV mehr kann als der Stick, aber ich habe gesehen das die Speicherungskapazität doppelt so gross ist. Diese Entscheidung hat unsere Totalkosten um $35.00 auf $219.00 erhöht (dies ist der genaue Betrag den wir jedes Monat fürs Kabel bezahlen). 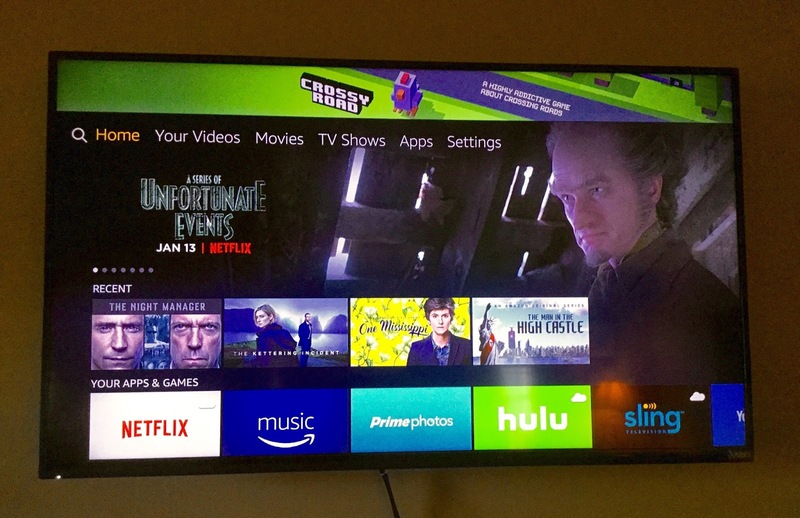 Wir werden den Fire TV im Wohnzimmer installieren, und den Stick in unserem Schlafzimmer. Die ist eine Bequemlichkeitswahl, denn der Stick ist sehr mobil - man muss ihn nur von einem Fernseher herausziehen und in einen anderen hineinstecken. Wir haben entschieden sie in den diversen TV's stecken zu lassen. I will let you know how this part of the experiment goes! Irene is it for the week! As if I do not have enough to do 😀! I was recently offered the opportunity to participate in the 52 quilters project. 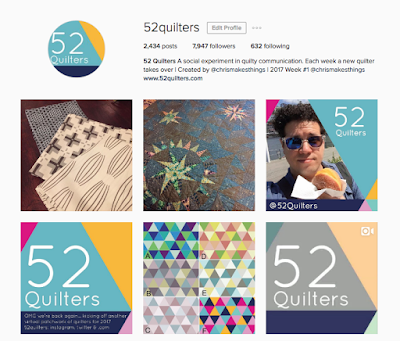 A different quilter takes over the "52 Quilters" Social Media platforms for one week, each week of the year. I was asked to be that quilter this week (on VERY short notice, as in yesterday, after someone else dropped out). Ich habe ja genug zu tun! Aber, mir wurde vor kurzem angeboten am "52 Quilters" Projekt teilzunehmen. Ein(e) andere(r) Quilter(in) übernimmt alle Medien Plattformen jede Woche. Ich bin ab heute dran (habe das erst gestern erfahren nachdem jemand ausgefallen ist). Here we go! 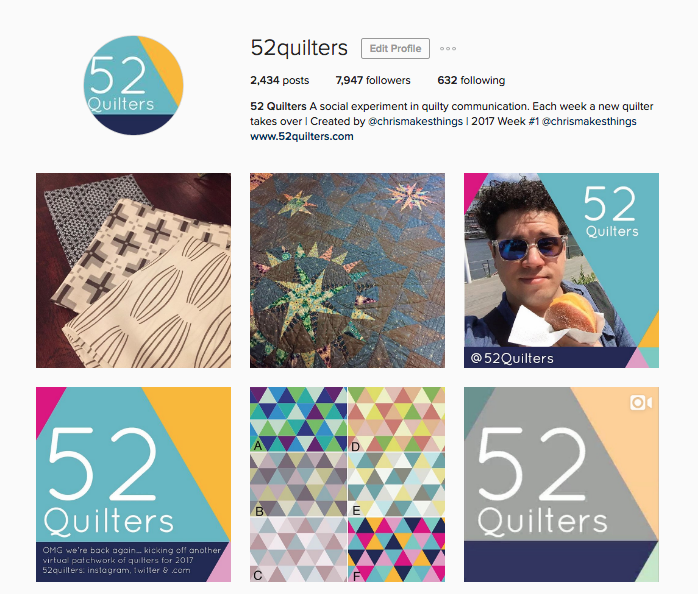 Another year is upon us... after two years going strong on 52Quilters I've had 104 takeovers and our Instagram is on the verge of reaching 8k followers! I'm so pleased with how things have gone this year... though I spent a lot of the year quite behind on emails and 52Q admin, it was all worth it. Every time I start to think I'm going to pack it in or pass it on to someone else, a featured quilter or follower gets in touch and shares a really nice experience they've had and I realise just how rewarding the project can be for people. Of course part of the success stems from the quilters who takeover, but at the risk of sound super cheesy, I have to say the success is really down to YOU the followers. Some of the featured quilters are social media gurus and already running bustling accounts, but for the newbies or nervous sharers who take over, it is a great experience to share their work with 7000+ people for a week. Those who make the most of it share ideas, get feedback, share tutorials and make new connections - but it is the welcoming and supportive followers that make it so rewarding. My personal goal for 2017 is to get more projects finished and put more positivity out into the world, and I couldn't start my year by taking away the 52'... otherwise I'd be in positivity deficit for until 2018! So the call for 52Q 2017 is officially OPEN! Read all about it here and get involved - or encourage someone you know to get involved. If you'd like to be involved please fill in the form by 11:59 pm Greenwich Mean Time on January 20th - just do it now so you don' forget!